Saint Mary's Church - Stained Glass Inc.
We recently received a call from a church in Sanger, California that was looking for a special stained glass window. 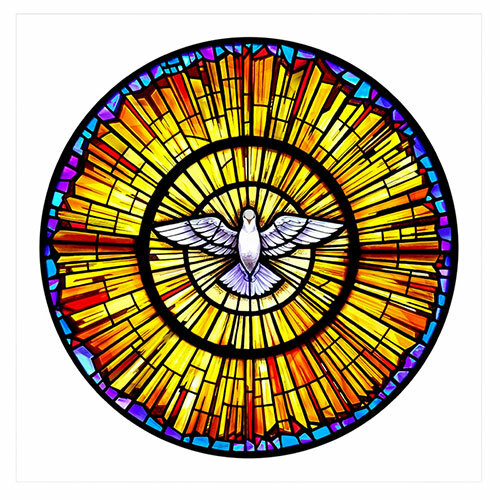 They wanted a beautiful round stained glass window of a dove, similar to the one in the Vatican, but they had not found anyone who could meet their needs for time, quality and budget. At Stained Glass Inc., we were able to take their concept and develop artwork for a stained glass window. After working with Saint Mary's and listening to their design ideas our artists created a "proof" which we sent to them for their review and they loved it. The proof was exactly what the church was looking for; it fit their design ideas perfectly. Once the proof was approved by the church committee, we were able to supply a beautiful stained glass window insert to them within 3 weeks. Saint Mary's Catholic Church reports that the church is very pleased with the stained glass window. The window insert fit perfectly into their existing window frame and casts beautiful, colorful light throughout the church. The rose window features a dove, which represents the Holy Spirit and is a constant reminder to the congregation of God's eternal love and salvation through Christ. If you are interested in stained glass for your church, then please contact Stained Glass Inc. right away. We are here to help you create the stained glass project of your dreams. Our talented stained glass artists will work with you to achieve the perfect stained glass design for your church. We work hard to make sure that you are completely satisfied and that your unique stained glass artwork fits perfectly in your space. We sell our stained glass window inserts to churches and residences all over the United States, as well as internationally and all design work and manufacturing is done right here in Texas.